This STREET LEGAL 2002 XR650R for sale has many aftermarket parts and goodies, like a Pro Circuit Exhaust Pipe, larger fuel tank, skid plate, K&N filter conversion, Jetted, Renthal bars, IMS foot pegs, and a STREET LEGAL KIT. The bike has less than 20 total hours on it and is in nearly PERFECT, used condition. 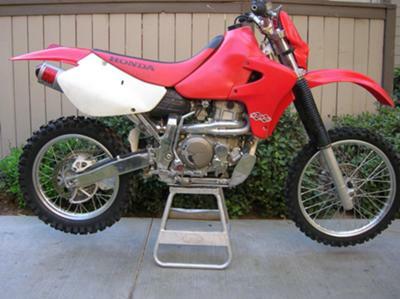 The bright red and white 2002 HONDA XR650R for Sale looks super and I have a clear and clean Nevada STREET title for it. If you would like to write a review or voice any opinions on the 02 model Honda for sale, you may use the comments form below this ad to do so. Thanks for visiting GoGoCycles Used Motorcycles for Sale and for taking a look at my 2002 HONDA XR650R for Sale. My location is Pahrump Nevada in the Las Vegas NV area and in my opinion my asking price is cheap enough that it can't be beat on Craigslist or in an Ebay auction; $$3250 or you are welcome to submit a best offer for the dirt bike. If you want to take a look or have questions about the XR 650 R, EMAIL for more details and don't forget to mention that you found this ad on GoGoCycles Used Motorcycles and Parts for Sale www.gogocycles.com. is this motorcycle only kick starting or does it have an electric start too? hi there, are you still have the motorcycle?